Note: This analysis was updated on March 25, 2019. Under the Trump administration, the Interior Department has moved quickly to dramatically expand oil and gas drilling throughout public lands and waters, shrink national monuments, and reduce protections for threatened wildlife. At the same time, the agency has been staffed with oil and gas lobbyists who have in turn taken meetings with industry representatives asking for policy favors. Perhaps nobody represents the Interior Department’s swamp culture better than Deputy Interior Secretary David Bernhardt, a former high-powered oil and gas lobbyist installed as the agency’s second-in-command who is now set to take charge after the resignation of Secretary Ryan Zinke. In between two stints at the Interior Department under the George W. Bush and Trump administrations, Bernhardt was a DC lawyer and lobbyist for scores of corporate clients, including multinational oil and gas companies, mining interests, and major Western water users. Facing questions over his lengthy time as a lobbyist, Bernhardt acknowledged in his Senate confirmation hearing that he would not have qualified for his current position under Obama-era ethics rules. 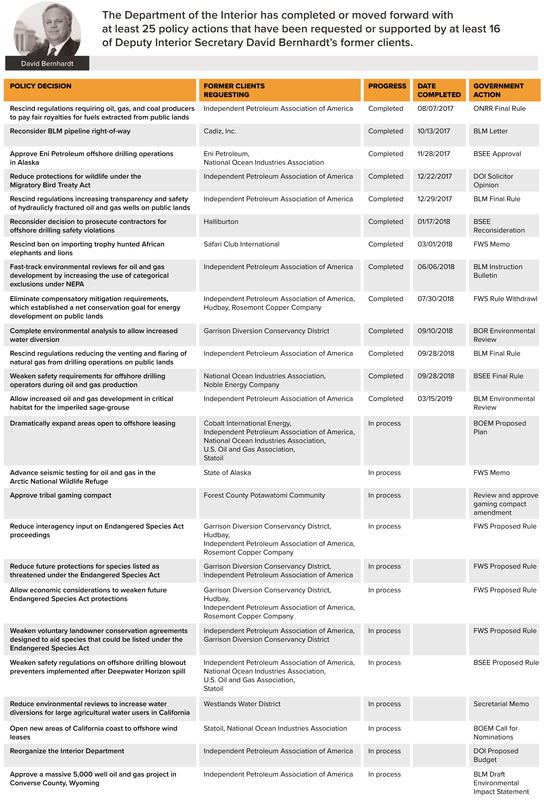 An analysis by the Center for Western Priorities finds that during Bernhardt’s tenure as Deputy Interior Secretary, the agency has completed or moved forward with at least 25 policy actions that have been requested or supported by at least 16 of his former clients. In financial disclosures and ethics recusals, Bernhardt lists more than two dozen former clients. Additionally, Bernhardt represented multiple clients in litigation against the Interior Department over the past five years. Prior to his latest stint at the Interior Department, David Bernhardt directed the natural resources division of Brownstein Hyatt Farber Schreck, a major law firm that provides lobbying and legal services. This analysis compares policy requests of Bernhardt’s former clients, as identified by public submissions to the Interior Department, litigation, and other public statements, to policy actions taken by the Interior Department since David Bernhardt’s swearing in on August 1, 2017. After departing the George W. Bush administration, David Bernhardt went to work for a host of oil and gas companies and trade associations. His clients ranged from offshore drillers like Statoil Gulf Services (now Equinor) and Cobalt International Energy, to major onshore drilling companies like Noble Energy, and several industry trade associations, particularly the Independent Petroleum Association of America (IPAA) and the National Ocean Industries Association (NOIA). Disclosure forms indicate Bernhardt lobbied on legislation for some clients, and provided legal services to others. In just a year and a half since Bernhardt’s swearing in, the Interior Department has moved to dramatically expand offshore drilling and reduce safety regulations. Bernhardt is no stranger to offshore drilling, having lobbied on legislation related to leasing and development of the Outer Continental Shelf for Cobalt International Energy. The agency has proposed an offshore drilling plan that would open virtually the entire United States coast — Atlantic, Pacific, Gulf, and Alaskan — for leasing, a move requested by five of Bernhardt’s former clients, including Cobalt. At the same time, the Interior Department is proposing to weaken safety requirements relating to blowout preventers that were implemented after the deadly Deepwater Horizon oil spill — changes supported by many of Bernhardt’s former clients, including the Independent Petroleum Association of America, National Ocean Industries Association, U.S. Oil and Gas Association and Equinor (formerly Statoil). Under Bernhardt, the Interior Department has also made sweeping changes to advance oil and gas development on our public lands. In particular, the agency has eliminated rules designed to increase the safety of hydraulically fractured wells, reduce natural gas leaks from drilling operations, and require companies to pay taxpayers a fair share for fuels extracted from public lands, all policy changes supported by the Independent Petroleum Association of America. While many policy changes have been broad regulatory overhauls, some have benefitted past clients more specifically. Just 10 days after Bernhardt was sworn in, the Fish and Wildlife Service released a memo saying it had been ordered to change regulations in order to accept applications for seismic testing in Alaska’s Arctic National Wildlife Refuge. In 2014, Bernhardt represented the State of Alaska in a lawsuit over those same regulations, hoping to force seismic testing in the Arctic. Similarly, four months into Bernhardt’s tenure, the agency approved permits for Eni Petroleum US, a former client, to drill off of Alaska’s coast, the first such drilling since 2015. In the private sector, Bernhardt worked extensively as a lobbyist for California’s Westlands Water District, one of the largest agricultural water users in the country. Westlands has long sought to increase diversions from watersheds in northern California to benefit its users, raising questions about impacts to endangered fish species and what role the federal government should play in California water deliveries. Disclosures show that Westlands paid roughly $1.5 million to Bernhardt’s firm for lobbying services from 2011–2017 and that Bernhardt consistently lobbied Congress and the Interior Department for Westlands on “legislation related to the Bureau of Reclamation and the Endangered Species Act.” Further, Bernhardt argued a lawsuit on behalf of Westlands against the federal government over a policy decision that required the Bureau of Reclamation to change its pumping plan to accommodate endangered and threatened species. On August 17, 2018, just two weeks after Bernhardt’s ethics recusal for Westlands Water District expired, Secretary Zinke sent a memo tasking Bernhardt with creating a plan to speed deliveries of California water and limit environmental reviews under the Endangered Species Act, the same issues on which he had lobbied and litigated on for years. Bernhardt also provided legal services to Cadiz, Inc., a California corporation seeking to drain groundwater from beneath the Mojave Desert near Joshua Tree National Park and send it via pipeline to farms and cities in Southern California. 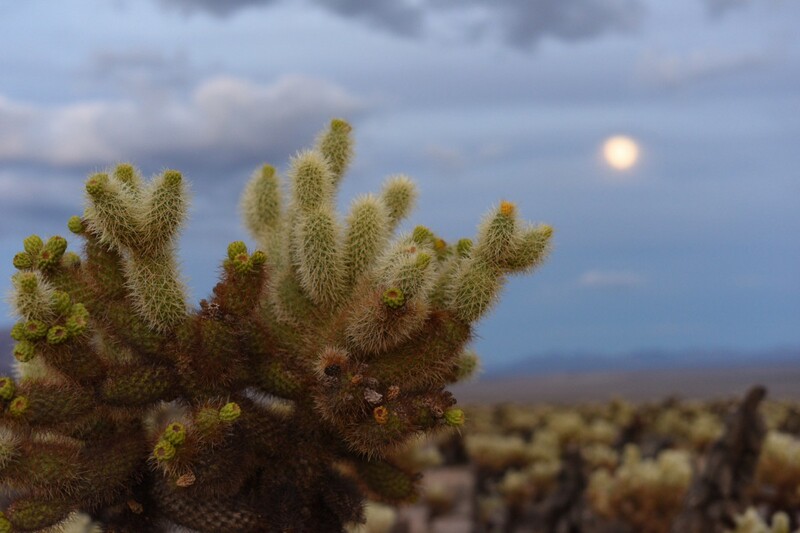 This extremely controversial project would have significant impacts on the California desert, potentially drying up oases and watering holes critical for wildlife, and is opposed by the state’s governor and U.S. senators. The project has faced a series of legal hurdles, including a 2015 determination that the Bureau of Land Management would need to issue a right-of-way for the pipeline project. Just two months after Bernhardt’s swearing-in, the agency sent a letter to Cadiz, Inc., reversing the previous decision and stating the project did not require BLM authorization, lifting a key roadblock to advancing the project. A common thread between many of Bernhardt’s clients is a view that protections for imperiled wildlife are barriers to extractive industries that should be watered down significantly. As Deputy Secretary, Bernhardt has also been placed in charge of overseeing efforts to conserve the sage-grouse. In 2015, Western governors of both parties, ranchers, industry, and conservationists agreed to landmark deals that would seek to conserve key habitat. The plans sought to prevent an Endangered Species Act listing, an outcome that would severely restrict development, particularly oil and gas drilling. 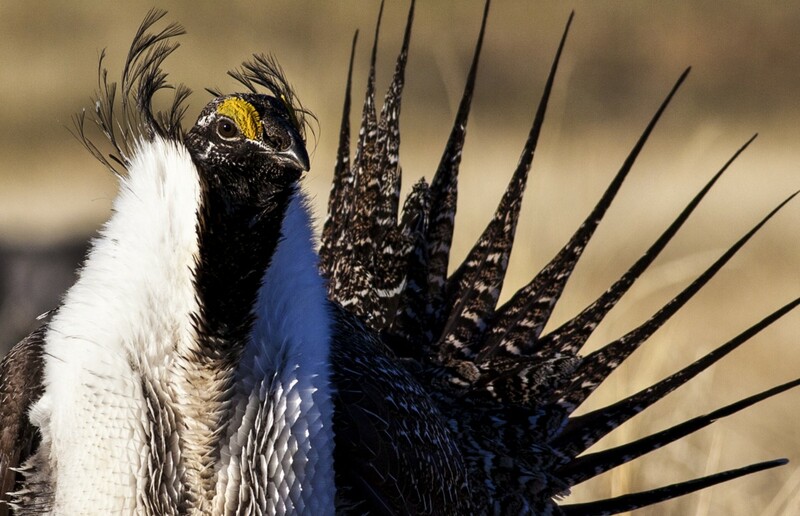 In December 2018, with Bernhardt at the helm, the Interior Department broke the historic agreement and finalized plans to strip protections for sage-grouse, opening up nine million acres of key habitat to oil and gas drilling. Unsurprisingly, an analysis of Interior Department emails by the Western Values Project found that the Independent Petroleum Association of America, a former Bernhardt client, had input into the changes to the plan. 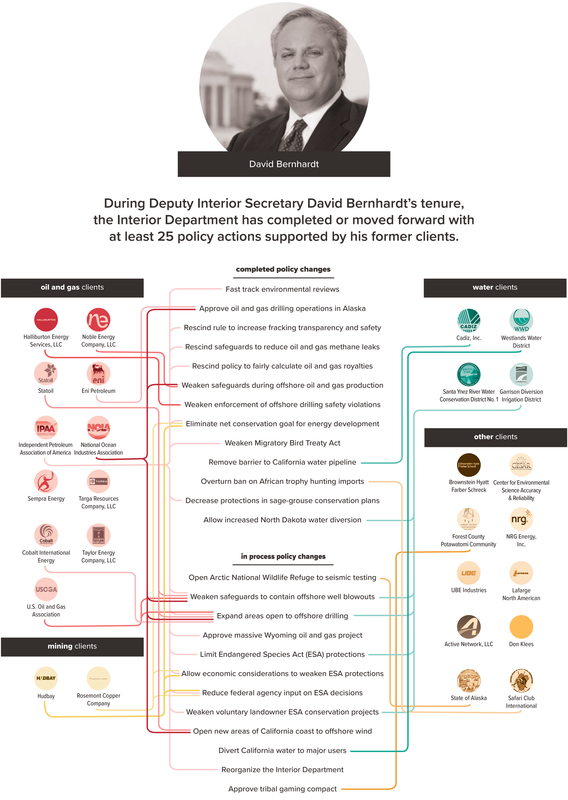 With such a wide array of clients, David Bernhardt’s conflicts at the Interior Department aren’t limited to just drilling and mining. He also provided legal services to the Safari Club International Foundation, the 501(c)(3) wing of Safari Club International, a hunting advocacy group. SCI has long fought restrictions on trophy hunting imports, even suing the Interior Department over the import ban of trophy-hunted African elephants and lions. On March 1, 2018, in response to the SCI lawsuit, the Fish and Wildlife Service issued a memo overturning previous Endangered Species Act findings related to African elephants and lions and allowing the import of elephant and lion trophies from certain African countries. Bernhardt has also represented Native American communities, providing legal advice on gaming issues. For instance, he represented the Forest County Potawatomi Community, a Wisconsin tribe that operates a casino in Milwaukee. The tribe is currently in negotiations with the state of Wisconsin to amend its gaming compact in the face of new casinos opening in the region. The amended gaming compact is being reviewed by the Bureau of Indian Affairs, which sits in the Interior Department, and had previously rejected changes proposed by the tribe in 2015. With Secretary Zinke’s announced resignation, David Bernhardt is set to take charge of the Interior Department as acting secretary. His track record throughout just more than a year in office shows that he has already implemented massive changes that will benefit his former lobbying and legal clients. Now, more than ever, it is time for continued investigation and oversight of the Interior Department to ensure that David Bernhardt is acting in the interests of the American people, not his corporate clients.